I adore flowers and love gardening so spring is one of my favorite times of the year. It’s no surprise then that flowers make an appearance in my work from time to time (well, most of the time). David Scott Smith is also a fan of flowers. You might say it’s in his blood–his grandfather owned a flower shop and then, after “retirement” became a horticulture instructor. In this post, David explains how he makes bisque texture molds with wildflowers. Enjoy and then go take a walk and find some flowers to make your own! – Jennifer Poellot Harnetty, editor. As artists, we are constantly reflecting on the motivations behind our ceramics. Where does our work come from, and what makes our work (and us!) so unique and individual? I have a love for flowers, especially wildflowers, that I can trace back to when I was a young boy. My step-grandfather, Charles Parsons, has always been a great inspiration for me—for 18 years he owned Coldwell Florist in Spokane, Washington, and after ‘retirement’ he worked for 15 years as Instructor of Horticulture at Spokane Community College. Floral design, plant propagation, landscaping—these are all areas of Charlie’s expertise. But he also has a great love for plants that flower naturally in the wild, and some of my fondest memories were chasing wildflowers with my grandfather. Wildflowers are usually as delicate as they are beautiful. Sometimes only a few inches tall, their cycles might last a brief couple of days to a week, and each warm spring day welcomes new growth, and new flowers. If you live in the mountains, you can follow blooms with the elevation as the snow recedes; but even the first few weeks of spring on the flatlands are a riot of flowers that will disappear with the heat of summer. When I first started exploring mold-making in the early ’90s, I only worked with plaster. Try making a mold of a wildflower with plaster sometime—it’s a catastrophe. So for years I made molds of easily castable objects and shied away from plants and flowers. However, some years back I started using clay to make molds, which opened up a whole new arena of possibilities. Busy mom, artist, and educator Kari Radasch has streamlined her processes to make the most of her studio time, and she shares all of her secrets in her video Low-Tech Clay: High-End Results. This video is loaded with great ideas and techniques, from making and using simple hump molds, to decorating with terra sig and glazes. But the best part is that ALL the techniques are quick and accessible leaving you more time to be creative. But don’t let the low-tech methods fool you because the results are simply awesome! Sale valid through 3/3/19 at 11:59 pm EST USA. We are all familiar with sprig molds, or simple stamps and rollers made with clay. However, there’s no reason why a bisque clay mold can’t be as large as you want (or as large as you can fire in your kiln). I’ve found that clay molds give you the opportunity to easily cast textures that are nearly impossible with plaster. I have clay molds of alligator skin, insects, tree bark, carpet, lace, braids of hair—and of course wildflowers! The best part is, once you’ve made the mold, you can use it for just about anything. I’ll use the same mold for slab-built pots, lamps, fountains, tile, etc. And if you keep your molds clean (and never use a ‘release’ agent) they will last almost indefinitely. I remember when I first started using large clay molds I foolishly thought I had developed the technique, and a professor showed me the work of Bernard Palissy (French ceramist, 1510–1590), not to mention the ceramic work of a dozen ancient cultures. People have been using clay molds for thousands of years, and if you buried your bisque molds below the frost line someone could dig them up in a thousand years and use them. 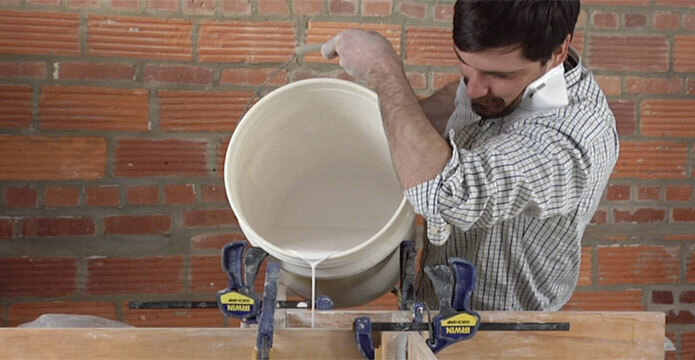 In many respects, clay molds are superior to plaster, and certainly easier to make. I prefer a smooth high-fire clay body for making bisque molds. For small or delicate flowers and leaves I use a slab about ¼-inch thick, but you can use a thicker slab for plants with more relief. First, carefully wipe the slab smooth of any texture; I use a lightly dampened sponge, but you can also use a rubber rib. Wildflowers are delicate and wilt immediately; I use a large ice chest with several inches of ice water to transport my cut flowers. Even if they are immersed in water they will stay fresh; pat them dry before pressing them into clay. Get out of your car. Some of the best flowers are tiny, and you won’t see them hurtling down the road in your vehicle. Don’t just look for flowers—new spring leaves, fresh and unblemished, can be used to create wonderful compositions. Horsetails, ferns, moss—just about any natural texture can be captured in a clay mold. Just as you might create a floral arrangement in a vase, I will also ‘arrange’ a variety of flowers to be cast together, into one unified composition. I often wrap and press large slabs of clay around tree trunks for bark texture, or driftwood, or even interesting rock formations. If the clay sticks to the surface of what you intend to cast, spray it with WD-40 or a vegetable oil. These will burn away when the mold is bisque fired. Make sure you know what you’re collecting is legal to collect! There are several protected species of native plants, and it’s also illegal to collect in national parks. artists, bisque, bisque clay, bisque molds, body, cast, castable, ceramic, ceramic work, ceramics, clay, clay body, clay molds, collect, collecting, community, composition, cut, design, dig, dry, fire clay, flower, flowers, growth, heat, high fire, homemade, inspiration, kiln, mold, mold making, molds, natural, plaster, possibilities, pots, rib, shop, slab, sponge, sprig molds, summer, surface, technique, texture, tile, time, vase, warm, water. How do you get those very fine petals and so on out without marking the clay? Or do you just let them burn up in tje kiln? Thank you David for a great technique! I work in an herbarium and have always wondered how to “immortalize” plants. Since seeing your technique I have made some great molds, the two I have used most were made off of sword ferns (front and back to include those great sori) and ginkgo leaves. The sword fern molds used to make textured tile we used in our bathroom, amazing! Thank you! It’s a great idea and it has a lot of means. I’m making jewellery with leaves and flowers. I’ve begun making molds, and now I’m making stamps like you. I’m getting really gods results. Thank you very mucho for your article. Trabajo con mis alumnos con pequeñas flores u hojas del lugar (de los arreddores de la Institución). Es una fuente infinita de posibilidades las que se disparan a partir de ello. Te agradezco el artículo,… me llevó a pensar en las caminatas en la montaña, donde puntualmente en verano salen unas orquídeas silvestres, que no duran más de 2 o 3 días… ojalá pueda recoger alguna el próximo verano para ver como me vá con ellas. I have used ‘nature’ in my work for a very long time! Never thought of making a mold – I made my first tree bark mold today and will make a flower one later tonight or tomorrow. So excited to see how it works. Love this technique! have used it on body castings…though I have found that using a very fine sand paper (200-400 grit) trims away burrs quickly when it is bone dry without having to worry about ‘smooshing’ your clay with the xacto knife when its still soft. Use a mask with sand paper! Strings of beads, rings you may be wearing, bracelets, edges of coins, tree bark…ahhh so many textures to press into clay! also very nice ideas to make compositions of for example parts of roses, you can rearrange them , and create your own rose , or combinations from different plants , the same with insects , lets try!!! i have different kinds of poppy’s beautiful flowers, and i think its better to leave them on the slab during firing , because they are very fragile. I’ve put things directly onto the work but never thought of making a clay mold of them – Great idea! Thanks for the tip on thickness etc.. too ” I prefer a smooth high-fire clay body for making bisque molds.” Can I assume you mean a cone10 clay bisqued to 04? I’ve never thought of using clay, only plaster. I’m going to have a go as there are some beautiful flowers just starting now. Thank-you! I would like to second both of the questions and comments above. Would love to see the process using the flowers in the picture. I wonder – why not leave the plant material embedded in the clay? It would fire out – if you didn’t mind the carbon in your kiln. Thank you! it is an interesting idea but I would have liked more! I have used bisqueware for molds for masks, bowls,and sprig molds, but hadn’t considered using it for large texture molds. I will try it, probably today. But I would have liked to see some examples of his work.